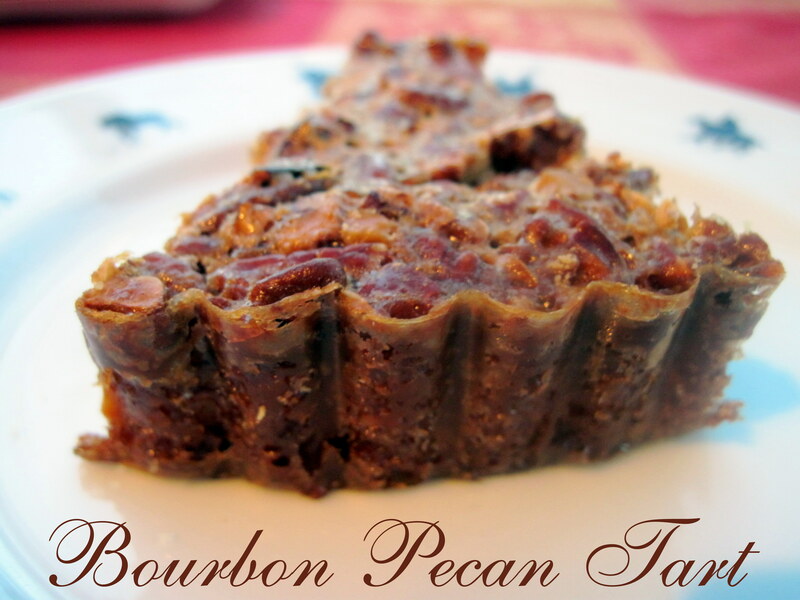 Pecan and Bourbon Tart and a $600 Visa Gift Card HOLIDAY GIVEAWAY!! I have joined up with some fabulous bloggers for a GIVEAWAY!! It’s always perfect timing to win some extra cash for the holidays! We are giving away a $600 Gift Card!!! Carrie’s Experimental Kitchen, Ally’s Kitchen, Basilmomma, That Skinny Chick Can Bake,Lauren Kelly Nutrition, Moore or Less Cooking, Chocolate Chocolate and More, Food Done Light, Bobbi’s Kozy Kitchen, Cupcakes & Kale Chips, Recipes for My Boys, Knead to Cook,The Fountain Avenue Kitchen and Amee’s Savory Dish. A while back, Amy loaned me her fabulous cookbook: SARABETH’S BAKERY~ FROM MY HANDS TO YOURS BY SARABETH LEVINE. It is one of those cookbooks that I just cherish and go back and forth from page to page and imagine baking everything in her cookbook. I decided to start with her Bourbon Pecan Tart. I was not disappointed, in fact I was thrilled by how magnificent my tart looked and it tasted heavenly! Make the full recipe of the Sweet Pie Dough and divide the dough into two equal discs. Freeze one and place the other into the refrigerator to rest for 30 minute, up to half an hour. Position a rack in the bottom third of the oven and preheat to 350 degrees. On a lightly floured work surface, roll out the dough into a 1/8 -inch-thick circle. Follow instructions how to prepare Sweet Tart Dough ( below). Line a 9-inch tart pan with a removable bottom with the dough. Pierce the bottom of the dough in a uniform pattern with a fork. Freeze for 15 minutes. Line the dough with a sheet of parchment paper and fill with pastry weights or dried beans. Place the tart pans on a half-sheet pan. Bake until the pastry looks set, about 12 minutes. Remove from the oven and remove the foil and weights. Continue baking the tart until the crust is barely browned, about 5 minutes longer. Remove from oven. Bring the corn syrup, sugar, and butter to a boil in a saucepan over medium heat, stirring occasionally, until the sugar dissolves, about 3 minutes. Remove from the heat and let cool, slightly. Whisk in the egg yolks and bourbon until they are incorporated. Add the pecans and mix well. Pour the pecan mixture into the pastry, Make sure the pecans are flat, not sticking up, so they don’t burn. Bake just until the filling has puffed evenly, about 35 minutes. If edges are browning too quickly cover with pieces of aluminum foil. Cool for 10 minutes in the tart pan. Remove the sides of the tart pan, transfer to a wire rack and cool until warm or room temperature. This filling is lighter than most pecan pies, the hint of Bourbon works to offset it’s sweetness, without making it so overpowering. Serve the tart warm with whipped cream. Beat the butter in the bowl of a heavy-duty stand mixer fitted with the paddle attachment on high speed until smooth, about 1 minute. Add the sugar and beat, occasionally scraping down the bowl, until very light in color and texture, about 3 minutes. Gradually dribble in the eggs and vanilla. Reduce the mixer speed to low and add the flour and salt. Mix just until the dough clumps together and the sides of the bowl are almost clean. When rolling out the dough, keep two things in mind. You want to roll it to an even thickness, and you don’t want it to stick to your work surface. If your dough is the right temperature and texture (chilled and malleable, not cold and hard or soft and sticky), it won’t crack and if it does, you can always pinch it together with your fingertips. Lightly flour a work surface and your rolling pin. Place the dough on your floured work surface and sprinkle the top with flour. Roll evenly over the entire length of the dough, away from you. Give the dough an inch turn and repeat, making sure the dough is not sticking by throwing a bit of flour under the dough when needed. Continue around the circumference of the dough to create a circle of dough about a 1 1/2 inches larger than your tart pan. If your dough cracks around the edge, use your fingers to mold it together and continue rolling, turning ever so slightly. Once the dough is the correct size, fold over and brush the flour off the exposed side. Fold again into a triangle and brush the exposed side. Turn the dough over and brush the final side. Place the point of the dough in the center of your tart pan and unfold, carefully lifting the dough into the corners, avoiding stretching the dough. You will ultimately want your crust about a ¼ of an inch above the lip of the tart pan. If one side is higher than another, I cut the dough and transfer it to a shorter edge and incorporate that dough so the short side also has a ¼ inch lip . When dough is done, place in the freezer until ready to fill or cook. Fine Print~~The giveaway runs from December 2-15, 2013 and one winner will be randomly chosen and notified on December 16, 2013~~surprise surprise! Please read the complete Terms & Conditions as this giveaway is only valid for U.S residents only (Sorry, rules of the gift card company prohibit us from offering this outside of the U.S.). I would probably use it for my daughters wedding and maybe use it to buy groceries with the extra company that will be here over Christmas. I would use it to finally. Give my. Children the Christmas they deserve! Its been a long hard road for us! Then I would donate some to my church for a child in need! Can you please leave a comment on facebook. My e-mail has been messed up for 2 months now and I go onto it. I could really use and need this. Due to loosing our small business last year, it has been a struggle just to survive. We are not able to give gifts to anyone. We have grandchildren and great grandchildren that we would love to bless with gifts and a few elder people. That would be the best Christmas for us, to be able to give this year. We missed last year. Well anyways, thank you for the chance to win. GOD BLESS YOU ALL!! Merry CHRISTmas everyone!!! I would be extemely happy! Lol – I never buy myself anything so I would buy myself a new laptop! I need one so bad, my DVD dont work and my touch pad just recently quit and its time! Would love to win… sons are coming to visit my new place & money would come in handy for entertaining! I would use the money to get presents for entire family, including out of town. I would love to be able to randomly help someone during the Christmas season, whether it be paying for groceries, medicine, or other needs. I would maybe use it to buy tickets to spend Christmas at my son’s with the grandbabies. I can’t say I would buy lots of gifts.. I’m more of a saver so I’m thinking I would use it for groceries and gas! Money gets tight around the holidays with bills, gifts, ect. But on top of all of that, I recently got engaged and have a wedding to plan!! …..and pay for! Winning this would be a good chunk of change to start planning our wedding! 🙂 Thank you for the opportunity!! I would but my husband something for being a good provider for our household. He is always working hard and makes sure that we have the things we need. I am on disability so Christmas gifts from me are usually few and rare. I live with my daughter and her husband so I always buy for them first. Usually there is no money left to buy anything for my sisters and brother, or anyone else. With $600 I would really enjoy Christmas shopping for my family. I would use the money to buy Christmas for my step children.. My fiancé has worked the same job for almost 8 years and recently got laid off, due to the plant relocating from millersburg, to Texas.. He has always worked hard and supported his children, but is struggling now.. Thanks for the chance to win!! I would buy the ingredients to make this…YUM! After that, who knows! I would buy some new clothes since most of mine don’t fit after losing a lot of weight. I would use this money to buy gifts for my four little sweethearts. This would be a complete dream come true for us. I cannot even imagine winning. There is also a family in our church who is struggling, and it has been on my heart to help them for Christmas, although I have no means to do so. I would use this to give them a Christmas as well. I read through the other comments, and they brought tears to my eyes. It makes me happy to know that one of us will be blessed. Merry Christmas, and good luck to everyone. Thank you for your hard work in hosting! I would buy myself a new free standing range. Mine is on it’s last leg, Only has three working eyes and the thermostats are not working properly. Can’t step away for fear of burning everything I cook. She has lasted a long long time but its time for Santa to give her a rest and bring a new one. Thanks for the giveaway. Great giveaway, Nettie. Merry Christmas to you and your family. Merry Christmas Diane! Good Luck! Save it for a rainy day cause it always seems like when I’m broke something breaks. Merry Christmas!!! I would get the family a new tv. We still have the old models!! I would use it to buy food, it’s been a hard few months for us. I would use it for a Kindle for my husband and for our property taxes. Retirement makes $ little tighter. Great blog and FB page – thanks for the giveaway! I would use it for medications, food and bills, and give some to my children for Christmas!!! Would love to help out a family of 10 being raised by a single father. They are starting over and they don’t even have a Christmas tree. The father just started a new job couple of days ago. Awesome recipe and contest ! I would buy new cooking equipment if I won ! Thank you Cindy! Good Luck! I would be able to get more supplies for winter..It is cold here. Make a nice down payment on a new computer for hubby! I would use it to pay for airfare to travel for medical appointments @ U of W.
I would buy a new camera for my husband and a couple of new games for the wii and some new shoes for my mom and some star wars toys for nephews.